Poor night vision is most directly related to dysfunction of the photoreceptors, although it can be a side effect of some vision conditions. Combo of great natural nutrients for supporting night vision and overall retinal and eye health. Night vision & overall retinal support with a combination of great natural nutrients. For night & color vision, cornea & tear production. Source of carotenoids, antioxidants safranal and crocin. 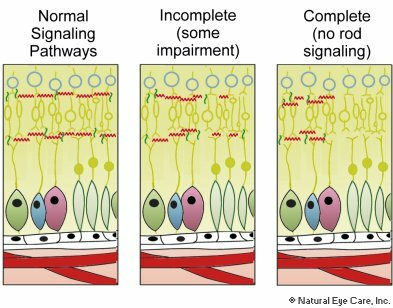 Photoreceptors in the retina are unique types of nerve cells that convert light into electrical signals, which pass through the optic nerve to be interpreted by the brain. The rods and cones work both by themselves, and together, to allow you to adjust to changes in brightness and darkness. There are actually three types of photoreceptor cells that process light and give us vision. Cone cells are responsible for the absorption of light and color vision in bright light. They are located in the central portion of the retina for fine visual color and detail. Cones adjust to changes in brightness very quickly and in very bright light. Rod cells predominate in the periphery of the retina, away from the central macula. They permit dim and dark light vision and also detect motion. They are responsible for night vision. Rods are more sensitive to light than cones; they can detect single photons of light and isolate that information from other fluctuations. Rods transmit their information to rod bipolar cells that interpret these single photons, in summary, to generate usable information. The third group is photosensitive retinal ganglion cells, which were first identified in rod-less and cone-less lab animals and later in rod-less and cone-less humans who could still perceive light. They do not record pattern or image, but instead interpret ambient light intensity. They are modulated by melatonin and contain melanopsin, which affects pupil dilation and dark adaption, so they may be involved in poor night vision, to some extent. Additionally, they appear to be resistant to photoreceptor loss in retinal degeneration conditions. At night, melatonin is secreted by rod and cone photoreceptors, functioning as a dark-adaptive signal. In turn, melatonin modulates these ganglion-cell photoreceptors. The photoreceptors transmit messages to bipolar cells that, in turn, transmit the messages to ganglion cells, which send the information to the brain. Presently, medical professionals categorize poor night vision in two different ways: as genetically based or as a symptom of several different diseases or conditions. Congenital Stationary Night Blindness (CSNB) is the genetic form of night blindness and there are two types: the complete form and the incomplete form. Some types of genetic night blindness are X-linked (associated with myopia), but others arise due to dominant and recessive gene mutations. The complete form (CSNB1) is characterized by total absence of rod pathway function, which means that the rods in the retina do not respond to light, making it impossible to see in dim light conditions. This form of X-linked CSNB is linked to mutations in the NYX gene that encodes a protein with an unknown function. The incomplete form (CSNB2) is due to an impaired rod and cone pathway function, which tends to allow for some vision in dim conditions. This form is caused by CACNA1F gene mutations. This gene allows a slow rate of deactivation that is important in light adaption. To summarize, everyone with the complete form has night blindness, while not all people with the incomplete form have night blindness. Although there is no current cure for poor night vision or night blindness, treating the underlying cause, if there is a health condition identified such as diabetes or glaucoma, is essential. See our recommendations for diet / lifestyle. Vegetables. Vitamin A rich vegetables such as dark green vegetables like spinach, collards, and orange and yellow vegetables such as carrots and sweet potatoes. Slow down. That way, you give yourself more time to react to any unexpected hazards. Always wear sunglasses outside, especially on bright days. Blue and green eyed people are particularly sensitive to potential sun-induced damage, so the use of eye protection is paramount. Amber and grey lenses are the most effective protection against UVA/UVB and blue light. Get prescription glasses for driving at night if needed (see your eye doctor to determine if they would be helpful). Non-glare glasses. You can get non-glare glasses with an anti-reflective coating. Look to the right. Look at the roadway's edge to the right to help you avoid the glare of oncoming headlights. Leave the driving till tomorrow. Drive only during the day. Even good lighting conditions at night such as found in a big city can be troublesome to someone with night blindness. An early indicator of a deficiency in vitamin A may be night blindness. A primary source of vitamin A is from animal sources, so diets such as a vegan diet without eggs, dairy, some fish, and/or organ meats may result in deficiency of vitamin A. The body makes vitamin A from beta-carotene found in yellow/orange vegetables and fruits, so if those are also not part of the diet, the risk is greater. Health care providers may recommend vitamin A (10,000 - 25,000 IU) daily in order to overcome deficiency. Beta-carotene can also be taken to reverse a deficiency, but it is not as effective as taking vitamin A directly. This is because beta-carotene is absorbed slowly by the body and slowly converted to vitamin A.
Vitamin A palmitate is the best form of supplemental vitamin A. 15,000 IU is often the recommended daily dosage (check with your doctor or nutritionist). Note that vitamin A is contra-indicated for those suffering from Stargardt's disease. Night blindness may also be the result of a zinc deficiency1 that reduces the activity of an enzyme that helps the body produce vitamin A (retinol dehydrogenase). Research has shown that taking a zinc supplement is helpful. Healthcare providers often recommend 15 - 30 mg of zinc daily for vision. At the same time long-term supplementation with zinc may lower copper levels, so 1 - 2 mg of copper daily is recommended to be taken with zinc for extended use. In general, the recommended supplement ratio is 15:1 zinc to copper. Consult your medical professional for correct dosage if you are supplementing with zinc. Bilberry (a blueberry relative) grows in northern Europe and North America in the wild. It is rich in flavonoids, specifically bilberry which is rich in anthocyanosides, the elements in plants that provide color. These natural chemicals are potent antioxidants that, among other benefits, enhance the creation of the purple pigment (rhodopsin) that is used by the rods in the back of the eye to assist with night vision. Early research has shown that bilberry supplementation improves the speed of adapting to darkness for people who have poor night vision. 9. A.A. Nair, M.F. Marmore, ERG and other discriminators between advanced hydroxychloroquine retinopathy and retinitis pigmentosa, Documenta Ophthalmologica, April, 2017. 10. M.N. Hove, K.Z. Kilic-Biyik, et al, Clinical Characteristics, Mutation Spectrum, and Prevalence of Aland Eye Disease/Incomplete Congenital Stationary Night Blindness in Denmark, Investigations in Ophthalmology and Visual Science, December, 2016. Also see research on night blindness.